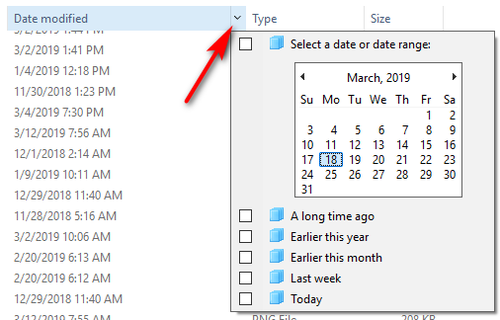 How to set time since column in Windows Explorer I.e. a few seconds ago, last week, last month. A while ago on one of the releases I noticed I can see a column in Explorer that would give me how long ago it was created or modified. Example: a few seconds ago, last week, last month. It appears I have looked everywhere apart from where the setting is. If so, how do I turn it on? Do you mean the "date modified" column? If it isn't there by default you can select it under the View>Add columns section. There's also the ability to create a column that can tell you when the item was created. Thank you Nick, I have that column. There is and I've seen the ability to have that column, or similar name and have it in a readable how long ago format. 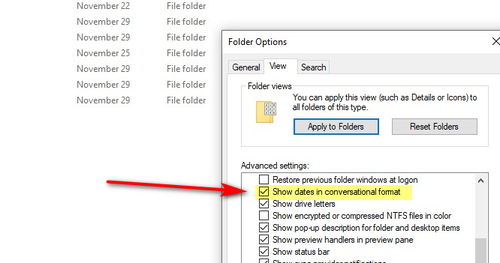 You should now have a Date Created column for that folder in File Explorer. 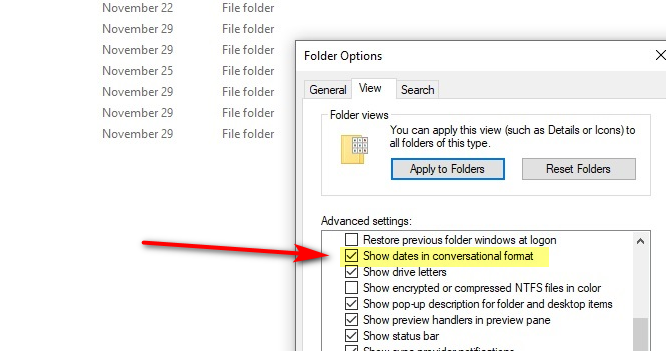 If memory serves, this isn't a setting that works across the folder structures - it only applies to the specific folder you've performed the above actions on. Yeah, that was my suggestion as well. But he wants to change the format of the information, so rather than it saying "date modified: 18/03/2019 11:40" it would say, "modified 3 days ago" if I understand correctly? Thank you, appreciate the steps. However, as Nick stated it's about how the information is displayed. I do believe it was in one of the windows insider releases, I am running the latest from the fast release. Perhaps they removed it again? 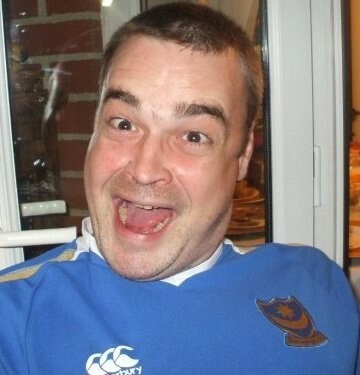 I have just found this. My current Windows build is Version 1903 – 18358.1 so perhaps I'm misunderstanding or they have removed it? Ah OK,. I don't ever recall Windows having that information displayed that way. Okay, I've done a little more digging. Apparently it is only available to some, so I must have had it at some point and then lost it. Oh, interesting. Although I'm glad that they are making it optional rather than forcing everyone to adopt it. Yes, I suspect the creatives will love it. The analyst would hate it. The right/left brain thinking. Are you thinking more of the filtering feature of date modified? I don't recall ever seeing that listed like you describe. 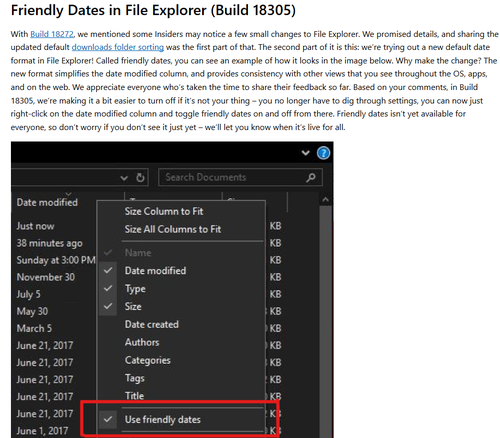 Starting with Windows 10 1903, Windows File Explorer is introducing a new feature for displaying dates on files called “Use Friendly Dates”. Yeah, that's what it was. I did manage to find the information, some users have it and some users do not. I did update above with this information but thank you for putting it all together.